【Toritsu-Daigaku】Quality vegetarian foods known for those in the know! The Toritsu-Daigaku is a calm residential area between the Jiyugaoka Station and the Gakugeidaigaku Station. The area with relaxing atmosphere is an ideal place to live. Here are restaurants and bakery serving vegetarian foods in the Toritsu-Daigaku known for those in the know. “35 North” is located under the elevated railway trucks near the Toritsu-Daigaku Station. To disseminate delicious bread and bread pairings from the shop at latitude 35 degree north, it is called “35 North”. All the bread is handmade by the baker trained in France. 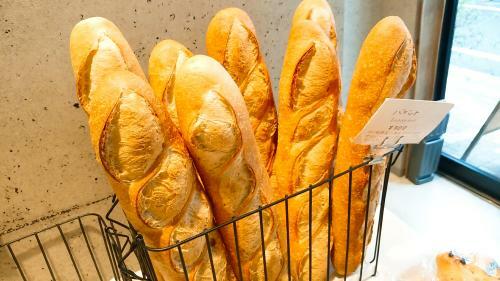 They are authentic French bread baked with natural yeast without using additives and colourings. Hokkaido wheat flour is used for hard type bread and blended French and Canadian flour for soft type. The baguette and croissant are the most popular items. The shop also sells bread made without egg and dairies. 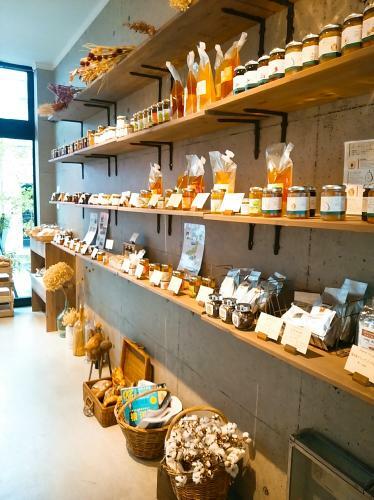 A variety of products from all over Japan is displayed in the simply decorated shop. Many of them are not found in other stores. Ripe organic fruit jams, Chiba peanuts butter made only with sugar and salt, Kochi small tomato juice, puree and ketchup, the dairies from Hokkaido and honey harvested in all over Japan. In addition, there are various products such as organic coffee, tea and curry sauce made only with olive and plant products. The Soycoupe is a sandwich of soy bread made with 50% soy and 50% wheat blend flour of VITAFLAVONE and soy and vegetable pastes. Its tomato paste has salt and herb flavour. About the pastes, other flavours such as sesame and beet are available. 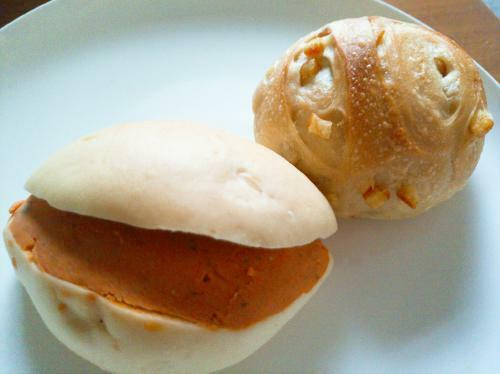 For vegan, the bakery serves soy smoothie and soy soup using soy paste instead of soy milk. They contain more isoflavone and GABA than normal soy milk and they are ideal food especially for ladies. 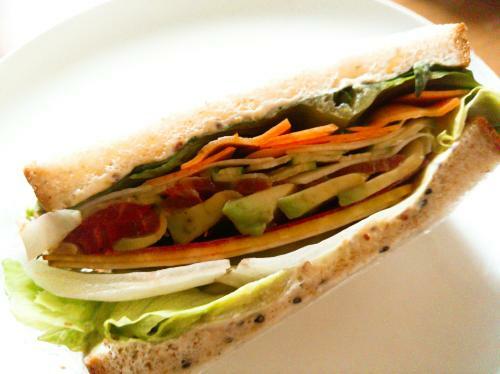 At the 35 North, we can enjoy sandwiches and deli foods from a sandwich shop in Mita, “Sandwich House H”. The photo is the vegetable sandwich. It looks beautiful. Access the official website from here. 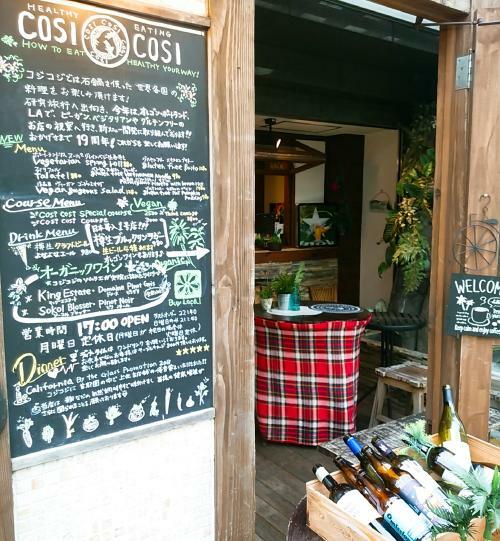 “Cosi Cosi” multinational restaurant serving a variety of vegetarian dishes is located within a five minute walk from the Toristu-Daigaku Station. The restaurant stylishly displaying empty bottles of wine has a relaxing and warm atmosphere. So many drinks and foods are on the menu that it takes long time to decide which to order. Besides meat and fish, many vegetarian dishes are available. Its cheese dishes are particularly recommended such as pizza with fresh Burrata cheese made in Toyo and Raclette cheese. You can also find a variety of gluten-free menus. When we visited there, it was in low-carb weeks. Rice flour vegetarian Burrito was on the menu. 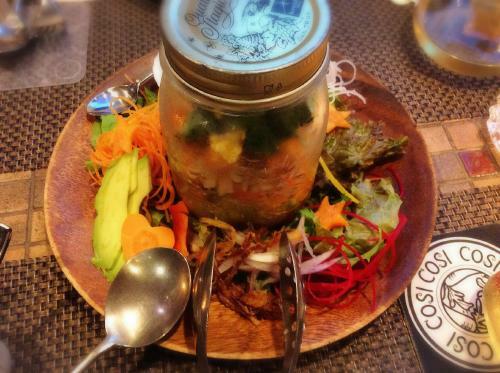 In the 18 Ingredients Vegan Salad, quinoa, sunflower seed, fried tofu and dressing are packed in a jar. Shake it well before serving. Star-shaped or heart-shaped carrots and shredded beets make the salad cute and colourful. 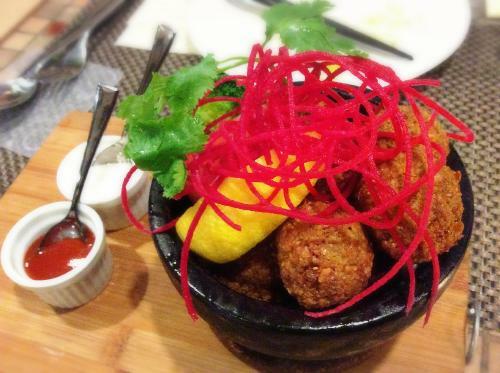 Vegan Spicy Croquettes (falafel) are served in a small hot stone pot. Eat them with tomato sauce and yogurt sauce. Also beet, tomato and broccoli make the dish beautifully colourful. The hot stone pot kept the croquettes warm. 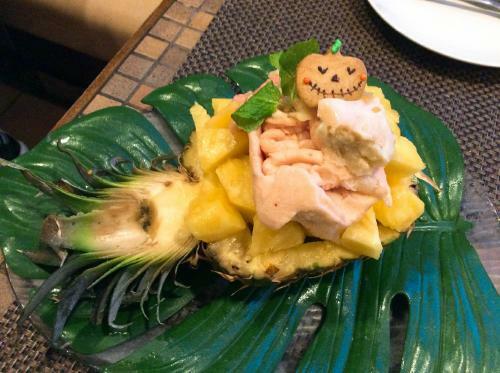 For dessert, we had pineapple and fruits ice in a pineapple bowl on Monster leaves served on a super cold plate. This is also a vegan dish. A topping for the ice was a Halloween cookie since it was the day for Halloween. This cute decoration idea was from the female chef. It was refreshingly delicious. The portion was big and we could share the dessert. Click here for location and detailed information on Cosi Cosi. 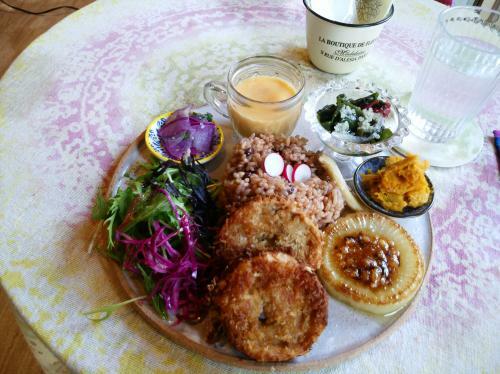 The vegan “Yumin café” is located within a five-minute walk from the Toritsu-Daigaku Station and it opens only 3 days a week (Thu, Fri and Sat). It has a homelike atmosphere. The cafe opened a year ago, but will be closed within 2 years due to the reconstruction of the building. We can enjoy the food only for another 2 more years! It serves Plate Lunch and Green Curry for lunch time. I had the Plate Lunch of 9 dishes; simmered Daikon, miso soup, butternut potage, fried wheat gluten, salad, seaweed mixed with citrus fruit, red Daikon mixed with malt, pumpkin mixed with peanut paste and 3 day fermented brown rice. Fermented brown rice mixed with Adzuki was chewy, soft and delicious. According to the restaurant, fermenting brown rice for 3 days makes the best result. Nicely decorated plate also satisfies our tummy. At the Yumin café, vegetables are cooked without water according to the macrobiotic cooking method, layer method. Making the most of the yin and yang characteristics of vegetables, the order of the layers is considered. The owner, Mr.Yumin also organizes monthly cooking class in the area. Besides, the café participates in events and offers catering services. Mr.Yumin explained about the food and cooking methods and we could learn a lot from him. He said he would start a new project in the next year. We expect more opportunities to taste his dishes. How do you think? The Toritsu-Daigaku area has many bakeries, the Hikawa Shrine and footpaths surrounded by greens and it is an ideal place to enjoy walking. We may discover another new spots in the future.